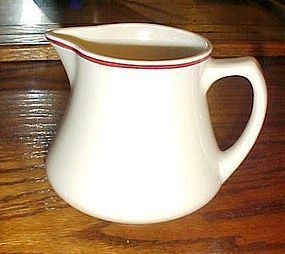 Exceptionally nice 4 1/2" tall pitcher made by Homer Laughlin. (Larger than a creamer) This is marked Best China, and is a nice heavy duty white porcelain with a marroon red stripe at the top. Wonderful addition to your restaurant ware. Pristine condition with no wear.